This is the ultimate luxury family Safari experience for families who are are looking for a experience that is different from the everyday tourists programs. This is definately a program for the families who are adventurous at heart and who want to experience Africa as it is supposed to be experienced. Enjoy the Tswalu video! On arrival at OR Tambo (Johannesburg) airport, look out for our representative. They will be holding a name-board with your surname on it. They will transfer you from the airport to the Anglo American Air Terminal. You board the charter flight to Tswalu only 12kg soft luggage per person allowed. Tswalu Kalahari Game Reserve in the Kalahari grasslands of the Northern Cape is the largest private game reserve in South Africa and the historical home of the Bushmen (San) people. The emphasis here is on exclusivity, which is why the entire reserve can accommodate no more than 30 people at a time. 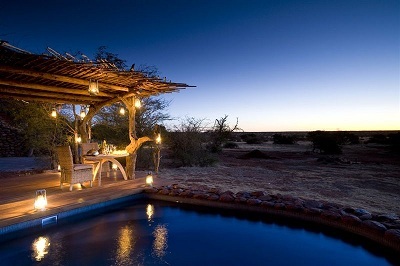 This spectacular malaria-free reserve offers a wealth of experiences - explore Tswalu by 4x4, on horseback or on foot. There is a sense of contentment that comes from being surrounded by so much space, the colours and textures, the myriad sounds and vast silences of the wilderness. You're sharing the environment with springbok, buffalo, lion, kudu, Bat-eared fox, hyena, meerkat and aardwolf. (Wildebeest, cheetah, the majestic Roan and Sable Antelope can also be seen.) Bush walks focus on the local vegetation, bush medicines, cosmetics and hunting skills of the San people, whilst sundowners on the lantern-lit dunes or bush dining at Lekgaba Lookout completes the experience. Other activities include star-gazing, visiting rock paintings, Moffat Mission and the Kuruman eye or focusing on the wild colonies of Meerkats. Motse lodge offers eight luxuriously appointed 'legae' (suites) including two family suites. The curved stone and sand walls are enclosed by thatched roof, providing shade and sculptural beauty. Each overlooks a waterhole and has a private lounge, open fireplace, private sun deck, outside shower, telephone and minibar. The staff at Tswalu tries to do everything possible to make sure not only mum and dad have a wonderful stay but that the children remember it as their best holiday ever. Special touches include a kiddies menu, special mealtimes for children, children's game drive (if there are more than four children at the lodge), visiting the stables or going horse-riding, stopping so the children can play in the sand or even roll down a sanddune. Older children can try their hand at archery or target shooting. Grootbos Private Nature Reserve, located amidst the spectacular fynbos and ancient dunes of the Southern Coast, is a multi-award winning gem. Overlooking Walker Bay, it's a nature-lovers paradise - all but the most committed urbanite will enjoy the inclusive activities: guided fynbos 4x4 drives, milkwood forest walks, horse riding, beach pincics and guided land-based whale-watching as well as the optional activities of boat-based whale watching and shark cage diving. A dedicated team including marine biologists and conservationists help you to appreciate what makes this area so special. Other excursions (at extra cost) include guided wine tours around the excellent Hermanus wine estates, aerial flights over the Ocean and visits to their community garden project to see sustainable tourism in action. Grootbos consists of two lodges, the family-friendly Garden Lodge with one and two bedroom suites and the new contemporary Forest Lodge. Grootbos Garden Lodge is a thatched stone homestead perched on the hillside surrounded by a lush indigenous fynbos garden. Fashioned from stone and thatch, Grootbos Garden Lodge reflects African warmth and hospitality. Outside is a terrace with swimming pool overlooking the Atlantic Ocean. Grootbos Garden Lodge and the 11 free-standing suites enjoy sweeping views over the fynbos-clad mountains. There's a choice of two bedroom and one bedroom luxury suites and one bedroom classic suites. The cosy restaurant has a central fireplace and bar. High beamed ceilings and endless windows enhance the incredible sensation of light and freedom. Additional facilities include a spacious lounge, beauty salon, library, Internet access and an entertainment room. There's also a telescope for in-house whale-watching. Each of the Luxury suites features romantic canopy beds, separate lounge with cosy fireplace, full bathroom, private wooden decks with panoramic sea or mountain views, filter coffee machines, minibar and underfloor heating. The Classic suites are slightly smaller with a sitting area rather than a separate lounge and a shower room. You drive 2- 2.5 hours to Sanbona for your 2 nights stay. Sanbona Wildlife Reserve, just off the Route 62 between Montagu and the Little Karoo, offers 54 000 hectares of exciting wildlife, undulating mountains and plains, indigenous wild flowers and San rock art. With the exciting reintroduction of elephant, buffalo, black rhino, cheetah and a male and female white lion, Sanbona is home to the Big Five. Guests can also visit the raptor rehabilitation and breeding centre or spend an afternoon spotting some of 160 bird species. Luxurious accommodation is at historic Tilney Manor (six suites) with its Wellness Centre and Spa, at Dwyka Tented Lodge (9 tented suites) with its Relaxation Retreat or in the Gondwana Lodge with twelve suites, ideal for family safaris. 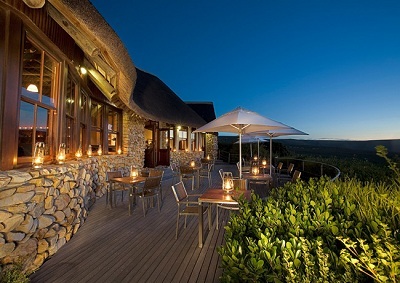 Gondwana Family Lodge resembles a typical thatched Karoo homestead. Eight of the twelve rooms are interleading but all rooms have en suite bathrooms with bath and shower, minibar, private patio or balcony, underfloor heating and air-conditioning. The main lodge has a communal rimflow pool as well as a children activity room (with TV & DVD player, games, outdoor play area, spacious lawn) for the kid's enjoyment. Children under four are not allowed on game drives. However children of all ages can enjoy the interpretive trail, with their own guide, through the lodge gardens learning about animals on the reserve. Child minders are also available at an additional cost. Gondwana Lodge has a resident therapist who offers beauty treatments and massages in the 'Relaxation Retreat'. As Sanbona is so vast, it is ideally suited to second time visitors to South Africa, or for clients visiting two game reserves rather than for people who are keen to see as much game as possible in a short period of time. Sanbona offers a more holistic experience where you enjoy the wildlife, plants, birds, San rock art and the extraordinary geology. 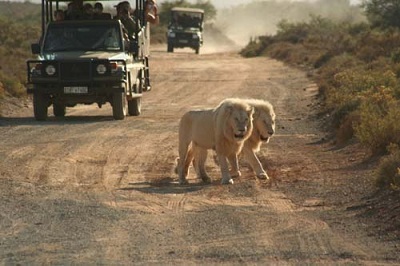 However Sanbona has the only free roaming white lions in Africa. This exciting white lion project is located in the far northern part of Sanbona. You drive back to Cape Town Airport +- 3 hours to 3.5 hours’ drive to Board your Flight.